2017 Board of Directors on the summit of Mount Greylock. Jack Parsell at the new tri-point monument for KS-MO-OK in October 2005. Clint pointing to the USGS benchmark on the summit of Crown Mountain - the HP of the US Virgin Islands. Daniel Butler, in front, points at Commissioner Rock while his father, David, points at Ellicott Rock - the GA-NC-SC tri-point. 1998 photo by Gregg Butler. “The following is a portion of an announcement made in Benham, KY on Oct. 18th. for a $2.55 million Abandoned Mine Lands Pilot Grant to restore and enhance the Portal 31 Exhibition Mine and create a scenic overlook and parking area at Black Mountain. The Black Mountain portion of the project will create a new parking area with a scenic overlook, which will lead to a new walking trail that will take visitors to the overlook at the summit of Black Mountain – the highest natural point in Kentucky. A proposed 40-foot high observation tower will provide a scenic view of Kentucky and Virginia. The owners sign the easement document. The September 2018 issue of Backpacker has a delightful 7-page story authored by Loren Mooney regarding her evolution from casual Hiker to dedicated Highpointer. It is insightful and humorous, especially her conclusions drawn from the quest. Do you recognize or relate to her observations? The club is run by unpaid volunteers, serving on distinct committees, some of which are standing committees described in the bylaws and others which are temporary initiatives. Some guidance is provided by 4 officers (pres, vice pres, treasurer, secretary) and 15 directors. If you have questions or comments, please contact the Club’s President at president@highpointers.org The current president is Alan Ritter. The club’s legal address is PO Box 1496, Golden, CO 80402 The club no longer offers a phone contact. The club mails a quarterly newsletter to members. Please alert the Editor of news and articles, as well as important personal milestones (climbing, hiking, exploring). Include photos. Send your comments & contributions to newsletter@highpointers.org Eric Lichtenstien is the new newsletter editor, replacing John Mitchler, and he is assisted by Justin Sutton. Contributions, comments, questions, and changes regarding this website should be directed to the web chair Kathy Dalsaso at website@highpointers.org Kathy’s committee includes a web team of Justin Sutton (content) and Clint Kaul. (architect and coding). Similarly, for the club’s Facebook page, please feel free to post on that site. Justin Sutton is the club’s fb administrator. 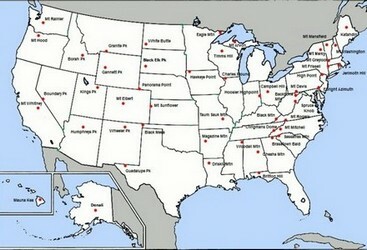 Please contact the club when you Complete the 50 state highpoints or if you Finish the Lower 48 highpoints. Contact Terry Bird at completers@highpointers.org We want to hear from every completer – – whether you are a club member or not, so don’t let that stop you. Also, if you are getting close to finishing, please alert Terry. Apply for club membership either online or by postal mail. Renewals may be made in the same way. Be sure to write anywhere on the application that it is a renewal and follow the same procedure as joining. Email membership at membership@highpointers.org Todd Curry (assisted by wife Irina) has volunteered to run membership. Please contact them regarding dues, membership, and updates to the database. This includes change of address, additions/subtractions of family members, and your Highpoint Count. The current address for membership is PO Box 473751, Charlotte, NC 28247. The Club sells various merchandise through “The Merc” as well as achievement awards. As of January 2019 Mary Groeneveld has assumed responsibility of the Merc after the five-year tenure of Nena & Bomber Brown (who took over from Jean Trousdale). Check out the Merc catalog in the quarterly newsletter, or watch for the upcoming online purchasing on this web site. Contact Mary at HPMerc@Outlook.com or at PO Box 41, Daggett, MI 49821. Here is what we have set up for MI-2019. The people in Baraga County are very enthused about us hosting the Convention there and supporting the counties local economy is a real plus for them. We have reserved all 68 rooms at the Baraga Lakeside Inn which will be our host Hotel.The address here is 900 US 41 South, PO box 873 Baraga, MI 49908 Phone (906) 353-7123 The hotel has blocked out all their rooms for us. Reservations will have to be made by phone and you will have to mention Highpointers Convention 2019 to make a reservation. We will have the “Icebreaker” evening at the Baraga Lakeside Inn on Thursday, July 25th with a picnic style hot dog and hamburger buffet which includes potato chips, Cole slaw, and ice cream sundae bar, smores and water, soda and iced tea. The hotel has really beautiful grounds along the lake and a bar inside as well. One can see both Mt. Arvon and Mt. Curwood across the lake! There will be picnic tables set up outside as well. We also have the pancake breakfast here on Saturday morning the 27th which consists of a breakfast buffet which includes scrambled eggs, Tuscan egg scramble, bacon, ham steaks, hash browns, cinnamon apple french toast casserole, assorted danish and muffins, a fruit tray and water/coffee/juice. The BOD meeting will also take place here. There is a room for registration and the Merc will be in this room as well. The hotel has a well stocked information section just inside the entrance door with a lot of information on things to see in the entire area. We will direct people from there to our reservation sign up table in the hotel as well as having a list at registration for people to look at. We have reserved the “Whirl-I-Gig: in L’Anse, MI for the night of the Banquet on Saturday the 27th and for the “Liar’s Club” gathering on Friday the 26th. There will be a cash bar open for both nights. The 6 lane bowling alley is downstairs and we will have full use of it on both nights. The “Whirl-I-Gig” can house as many as 300 people and it is used for weddings, banquets and such. There is plenty of room for the Merc, for the food and festivities. Catering will be done by Lisa and Bill Rosseau who are affiliated with the Whirl-I-Gig” rental hall. The banquet meal includes 2 meats: beef and chicken, 4 hot dishes: green bean casserole, kielbasa and sauerkraut, mashed potatoes and gravy and meatballs, 4 cold dishes: coleslaw, fresh fruit, pasta salad without meat or cheese and three bean salad. The Liar’s club gathering on Friday evening, July 26 will have hot dogs, hamburgers, pizza and salad and unlimited bowling. The cash bar will also be in service. Camping is also available which includes the Sturgeon River Campground on Forest Service Rd 2200 Phone (906) 932-1330, Ojibwa Campground along Lake Superior at 16429 Beartown Rd phone (906) 201-4174 and L’Anse Township Park and some forest campgrounds as well. Baraga State Park is only 0.7 miles from the host hotel. It has showers and a small store on the premises. The phone is: 1-800 447-2857 www.michigan.gov/dnr. The Baraga County Convention and Visitors Bureau is run by Tracey who is very enthused by the club hosting the 2019 Konvention. She has various books and souvenirs for sale as well. The address is: 755 Broad St. L’Anse, MI Phone (906) 524-7444. The beautiful Canyon Falls and Gorge is only 15 minutes from L’Anse. The easy and scenic hike to the falls and Gorge area only takes 15 to 20 minutes and is really a must see! No fees required for Canyon Falls. The Bishop Baraga Shrine (Shrine of the Snowshoe Priest) is in a lovely park setting minutes from L’Anse. It is Nationally recognized as a must see attraction. The Bishop Baraga Shrine also has a store/gift shop where people can try the famous Yooper food, the Pasty (pass-tee) and home made ice cream. No fees are required for the Bishop Baraga Shrine. Other great things to see in Michigan’s Upper Peninsula are: the Porcupine Mountains, Isle Royale National Park, Pictured Rocks National Lakeshore, Taquamenon Falls, The Soo Locks, historic Marquette and a fabulous collection of lighthouses to name a few! Various Mt Arvon and UP T-shirts, Sweatshirts and keepsakes can be purchased at Witz Marina in Skanee, Huron Bay Trading Post on the way to Mt. Arvon or at the visitors center in L’Anse. Last but certainly not least is the high point of Michigan, Mount Arvon which is very well marked now we are happy to report! It is about a 40 to 45 minute drive east of L’Anse. We will have a group hike up to Mt. Arvon on Saturday afternoon before the banquet and it has parking very close to the summit where we will actually have the watermelon ceremony in the parking area that afternoon as well! For those of you who have not been up on Mount Arvon in recent years you will be very happy to see how beautifully maintained it is now!! We have a theme for this convention which points out that the very first convention which was held on Mount Arvon 32 years ago with a group of nine people which included Jack Longacre of course and Jack and Joyce Parcells! Dennis Whitehead who is an active Club member, 50 completer and a TRUE YOOPER is going to be joining us and he will be talking about that first convention back in 1987 with club founder Guru Jack and 7 other convention attendees and sharing wonderful memories of our very first ” Konvention”!! We have official “Mt Arvon” Shirts for our 33rd convention and we have a poster that we put together with input from Dennis Whitehead that includes photos of “the original nine” at the first Konvention on 4/25/87 and the photo of 5 people positioned at the ” Jakk’s ashes” ceremony on 4/25/2003! Our theme is ” The first convention 4-25-1987, Jack’s Ashes return 4-25-2003 and the 33rd convention 7-27-2019″! This is on the back of our convention T-shirts! Dennis Whitehead has graciously agreed to be our keynote speaker for the evening! Dennis is a 50 completer and is a very well-established doctor in the upper peninsula and his stories of the early days of the High Pointers Club, its inception, the first Convention, and other interesting stories will be a delight to our audience, many of who will be making their first trip up to the rugged Upper Peninsula! In addition to those traditional dates, the owners will allow visitation the days before and after the convention, which for now will be Jul 22-Aug 2. These will be confirmed again in early July. Mt. San Antonio (10,068 ft) may have the opportunity to replace Mt. Whitney as the highpoint of California after enough signatures were submitted to allow Californians to vote on a ballot measure to split the Golden State into three. The three states would be named California, Northern California and Southern California. Mt. San Antonio, also known as Mount Baldy, the highest point in Los Angeles County, would be the highpoint of the new California. Mt. Whitney would retain its status as a highpoint, only now being the highest point in Southern California. Mt. Shasta, another 14er in California at 14,179 ft, would be the highest point in Northern California. So, could becoming a 52 Completer be in a highpointer’s future? Many experts warn that you may not want to put your crampons on yet. Should the measure pass, it would almost be certain to head for a court date. Depending on that outcome, the California Legislature may have to approve the measure, never mind the United States Congress, which once failed to act on a measure to split California into two states in the decade prior to the start of the Civil War.